A couple of Short-eared Owls were reported quartering a field with game crop near Charleston Farmhouse yesterday afternoon (Rebecca Rees, via SOS sightings). This is an excellent record, we don’t get many in Firle. Their favourite local spot is Rodmell Brooks, though recent winters have been quiet there. In years past, Glynde Levels was also a good place to find them. Apart from having the finest yellow eyes in all of creation, they are among the easiest owls to watch in the daytime – mid-afternoon onwards is usually best, although the Charleston pair were active at 2pm. 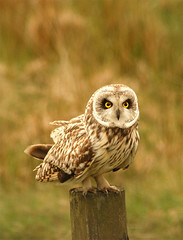 Incidentally, it’s great to be able to refer to SEO in the context of these magical birds. Most days, SEO stands primarily for Search Engine Optimisation in my book. Although if you’ve ever watched one of these birds hunt it’s clear that they too are optimised for search. This entry was posted in Local sightings, photo and tagged charleston, Charleston Farmhouse, firle, short-eared owl by Charlie Peverett. Bookmark the permalink. Good to hear about your two, as they hardly appeared at all last year. It seems that they, with other north-eastern species, have arrived early this year. Yes, I’ve already got my fruit-on-a-stick ready for those Waxwings; now planning voles-on-a-pole for the Shorties.